(Friday Fotos) Deliciousness: Colombia’s Eje Cafetero | Barranquilla or Bust! ← Colombia’s Calling, and BoB is On the Line! 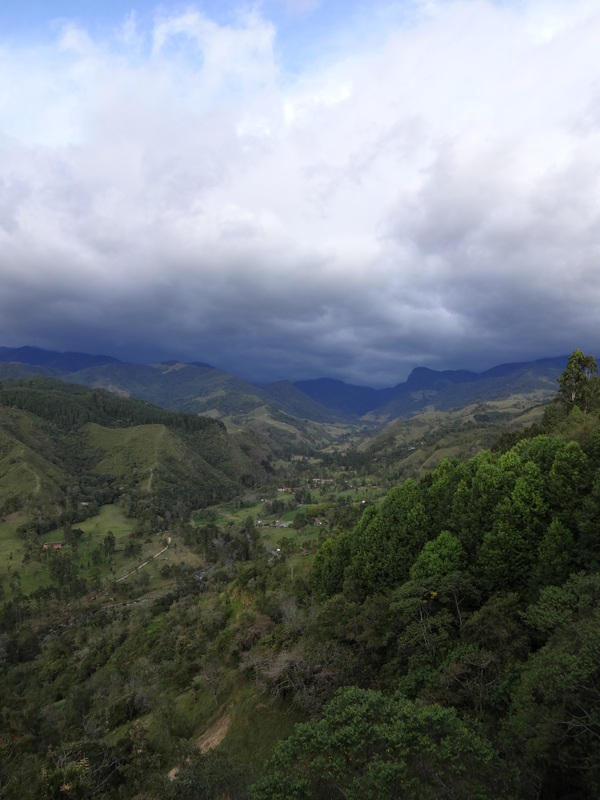 If I try to describe my trip last weekend to the Eje Cafetero – Colombia’s “Coffee Axis” – using words like “enchanting” and “magical”, you’re going to groan. Cocora Valley, as seen from Salento. You’ll think that I’m just one of those tired travel writers who can’t be bothered to come up more descriptive words, or who wants you to believe that I am having amazing experiences no matter how mediocre the reality. Or worse, you may think I’m the realtor trying to entice you with a “charming and quaint” (read: terribly cramped and lacking any renovation since the turn of the century) apartment. Normally – my being a terrifically (read that adverb as you see fit) skeptical person – I would agree with you. But in this case, you’d be wrong. The Eje Cafetero really was enchanting and magical – not to mention just plain fun and shockingly economical (and since when have you had a good surprise in the price department?). My husband Gio and I flew from Bogotá into the city of Armenia, which was devastated by a terrible earthquake in 1999 but has since been rebuilt. We then traveled around the surrounding countryside in the state of Quindío. We visited the popular theme park Panaca, which focuses on Colombia’s agricultural heritage (and whose cheesy Facebook page does not do it justice), and the Parque Nacional del Café, which includes both a cultural tour of Colombia’s coffee growing history and a big selection of roller coasters and other thrill rides. From the parks, we headed into the Valle de Cocora (Cocora Valley), where we saw the revered “palmas de cera del Quindío”, the national tree of Colombia. This protected species (scientific name: Ceroxilon quindiuense) is found only in the Colombian Andes. The trees can reach heights of 70 meters (229 feet) and live more than 100 years. In retrospect, perhaps the best word to describe this whole trip – not just the food and the coffee – is delicious. The trip was green, gorgeous, and delicious. We’ll be back. P.S. I’m thinking of starting a regular “Friday Fotos” feature. Good idea, or too much like your wacky cousin’s boring slideshows? Let me know! Happy weekend-ing! Bamboo bridge at the Parque Nacional del Café. Gorgeous tree in Panaca. Barranquilla has made us miss the green. Crazy flying Weimaraner at Panaca. View from a trail in Panaca. Horse or pony or something like that (can you tell how much I know about horses?) at Panaca. Flowers in the Parque Nacional del Café. An old Colombian cédula, the national ID card. Cable cars in the Parque Nacional del Café. Gio and me, on the cable car. The roadside cafe Bambusa, where for $4.50 US, we had arepas, soup, pork chops, plantains, rice, fries, salad, lemonade, and coffee. Score. The tintos – coffee made with agua de panela – at Bambusa. The mountains, as seen from the Valle de Cocora. Crossing a stream in Cocora. Courtenay and Gio on horseback. That is one Nervous Nellie, and I don’t mean the horse. Coffee liqueur, coffee arequipe, coffee candy, coffee anything you want. Pug dog sporting a Colombia World Cup shirt. One single, whole pizza-sized fried plantain (patacón). In Recuca, posing like old-timey coffee growers. Coffee plants, with plantain trees in the background (the bananas are covered with blue bags to protect them from birds). Trying my hand at picking coffee berries. There we are again, all dressed up! At the Armenia airport, nicknamed “El Eden” for good reason. Headed home. 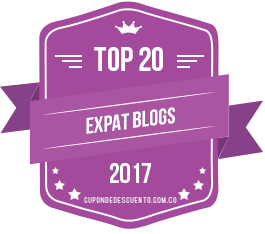 This entry was posted in Friday Fotos, Photography, Travel & Tourism and tagged adventure, Andes, Armenia, Cocora Valley, coffee, Colombia, expat, horseback riding, Latin America, Quindío department, Salento, south america, travel. Bookmark the permalink. Love the slideshow…you do realize imitation is a form of flattery? I am stealing the slideshow for my site! Courtney, we have never been to the Eje Cafetero region but I know it is supposed to be very green and a pleasant change from the unforgiving heat from the coast. Yesterday we were in Vermont and took the ferry on Lake Champlain. When we move to Killa, the green of Vermont (Latin for green mountain), seeing the big cows and bulls will be the one thing we will miss. Is ” El Huerto” ( the orchard ) still in business? Very organic but everything tastes like soft rubber. Yes, the green is something to be missed, though as you know Killa certainly has its own upsides as well. 🙂 The Eje Cafetero was a truly refreshing break, though. The perfect get-away from Killa. As for El Huerto, I don’t know about that — which doesn’t mean it isn’t still in business. I still have a lot to learn! I’ll have to look it up. You know the city well… keep the good tips coming! 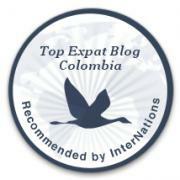 Hope your site really helps people and offers advice for those moving to South America, especially Colombia. But lately we are looking at Bogota. Cooler, much more of a city than Killa in ll due respect; I like Killa and being near to Cartagena and Santa Marta but we are looking at Bogota. Being a capital city, it is exotic and the center of almost everything to do with business..
What do you think? Have you been to Bogota? Hi Jeff! I’ve been to Bogota and found it to be a very cool (both in temperature and in hip factor) and cosmopolitan city. I visited there a few years before I moved to Colombia. I’m really looking forward to going back now that I have an expanded perspective on life here. There would definitely be some huge pluses to living in Bogota – a lot more cultural activities, greater ease and lower cost of international travel, etc. But I think I would have found it very overwhelming to move there directly from the U.S. Since we have family in Barranquilla, we had a support system here that was crucial during our transition time; we wouldn’t have had that in Bogota. I also find Bogota’s traffic to be completely overwhelming, though I think if I could live there without a car like we do in B’quilla and not feel trapped, that wouldn’t matter. I am definitely looking forward to visiting Medellin — I haven’t been there yet but keep hearing such amazing things. I know it’s warmer than Bogota. I could definitely do with less heat that Killa, but Bogota is a little too cold. I think Medellin would be perfect. And I hear it’s very green too, which is something that I really miss here. Plus great flights to the U.S. out of Medellin, too. Anyway, I am looking forward to checking it out. But I have all the respect in the world for Bogota — it is definitely a hip, happening place and I could see why anyone would choose it the location for their next move. I LOVE the Eje Cafetero. It’s been 5 years since I was there, and I can’t wait to go back. Thanks for the great pictures.